3.9 x 2.2 x 1.1 in. The Panasonic Lumix DMC-FH20 is a stylish compact digital camera with an effective resolution of 14.1 megapixels and an 8x optical zoom lens with a useful 28-224mm equivalent wide-angle setting. The Panasonic FH20's lens features a true optical image stabilization system to combat camera shake. The Panasonic FH20's lens has a two-step aperture that ranges from f/3.3 to f/10 at wide-angle, or f/5.9 to f/18 at telephoto. The minimum focusing distance for the Panasonic DMC-FH20 is ordinarily 50 centimeters, but drops to just five centimeters at wide-angle when switched to Macro mode. There's no optical viewfinder, with the Panasonic FH20 instead opting solely for a 2.7-inch LCD display with 230,000 dot resolution on which images and videos are both framed and reviewed. The Panasonic DMC-FH20 has a nine-point multi-area autofocus system which also includes a single-point "high speed" focusing mode. As with many digital cameras these days, there's also a face detection function, with Panasonic's implementation using the information to adjust both focus and exposure to properly capture your subjects' faces. ISO sensitivity ordinarily ranges from 80 to 1,600, with the ability to extend this as far as ISO 6,400 equivalent in High Sensitivity mode. Shutter speeds from 1/1,600 to 60 seconds are possible. The Panasonic FH20 uses Intelligent Multiple metering, and offers six white balance settings including Auto, Manual, and four fixed presets. A whopping selection of twenty five scene modes let users tailor the look of their images, useful given that the Panasonic FH20 doesn't offer aperture-, shutter-priority, or fully manual modes. There's also an Intelligent Scene Selection function, which can automatically select from a subset of six commonly used scene modes. A five mode flash strobe includes red-eye reduction capability, and has a rated range of up to 5.8 meters at wide-angle, or 3.2 meters at telephoto. The Panasonic FH20 also includes the company's Intelligent ISO and Intelligent Auto modes as seen on past models. As well as JPEG still images, the Panasonic FH20 can capture 30 frames-per-second movies with monaural sound at resolutions of 1,280 x 720 pixels or below, although the compression used is the older QuickTime Motion JPEG type so file sizes are likely to be hefty. The Panasonic Lumix FH20 stores its images and movies on either SD or SDHC cards, as well as the latest SDXC types. There's also a generous 40MB of built-in memory. Connectivity options include a USB 2.0 Full-Speed connection (rather than the much faster USB 2.0 High-Speed connections found on most current cameras), plus standard definition NTSC / PAL video output (or NTSC only for North America). Power comes from a proprietary lithium-on rechargeable with ID-Security feature that prevents use of counterfeit or third-party batteries, and is rated as good for 300 shots on a charge to CIPA testing standards. The software bundle includes PHOTOfunSTUDIO v5.0, Quicktime, and Adobe Reader. The Panasonic FH20 ships from mid-February 2010, priced at about US$200. Looks can be deceiving. At first glance, the Panasonic Lumix DMC-FH20 appears to be just another silver-bodied, candy-tin-sized digicam. Yes, it's both of those things but this compact 14.1-megapixel camera has an 8x optical zoom tucked away in its thin body with a solid range of 28-224mm, a feature you'll rarely find on a less-than-6 ounce model at this price. Let's discover if the Lumix FH20 should be part of your next vacation or family gathering. Look and Feel. You'll probably have the same reaction as I did when you see and hold the FH20 at the local store. Yawn! I suppose it's because we've seen so many silver pocket digital cameras. My silver review sample had a brushed metal front with a plastic rear panel. 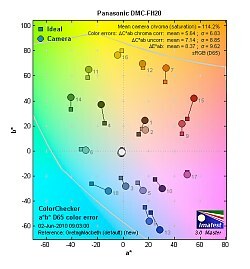 I'd opt for a different color as the Panasonic FH20 is also available in blue, black, red, and violet. There's nothing distinctive on the front surface other than a few raised logos. The critical feature is the self-retracting DC Vario 8x optical zoom with built-in lens cover. At maximum telephoto it extends about two inches from the body, which is still a very compact form factor. At the top right is an AF Assist lamp/self-timer indictor while the flash is slightly off center. The main feature on the rear of the Panasonic FH20 is a decent 2.7-inch LCD monitor rated a 230K dots. I took the Panasonic FH20 to the beach on a very sunny day and didn't have many problems framing shots since the camera was in the Auto Power LCD mode, which adjusts brightness depending on the ambient light (though it also reduces battery life, so be aware of that if you plan to shoot all day). The controls to the right of the LCD are fairly typical for a point-and-shoot digicam. There's a basic Record/Playback switch, a Mode button to pick between Normal Picture, My Scene, and Scene modes, as well as Motion Picture. The Panasonic FH20's four-way controller with center Menu/Set button gives direct access to flash options, macro, the self-timer and exposure compensation. Below this grouping is the Display button to select the number of icons that appear on screen with access to grid lines and a Quick Menu/Delete key. Pressing the Q. Menu button lets you adjust key parameters via an onscreen pulldown menu; options vary with the mode you're in. On the top of the Panasonic FH20 are the 4-pinhole speaker and a single-pinhole mono mic. There's also the on/off switch and the shutter release button surrounded by a zoom toggle and an iA button. This is a handy control that lets you quickly switch between Intelligent Auto and Normal Picture. With iA, the camera guesses what type of subject is in front of it and adjusts accordingly. It chooses between six options: i-Portrait, i-Scenery, Macro, i-Night Portrait, i-Night Scenery, and i-Sunset. This worked well. In Normal, which is more like Program, you can adjust white balance, ISO, resolution, burst mode, metering, OIS, and LCD adjustments. And don't forget--this is a point-and-shoot with zero options for changing aperture and shutter speed other than those done automatically via Scene modes. On the right side of the Panasonic FH20 are eyelets for the supplied wrist strap and small compartment with a metal door for the USB out. There is no mini HDMI out, so you can't watch HD videos directly on your HDTV. Worse yet, Panasonic doesn't have a component video cable option so even that avenue is closed. Bottom line? If you want to watch your clips on your HDTV you'll need a compatible set with an SD card slot that reads Motion JPEGs--and not many do, or some other device such as a laptop, etc. My three-year-old Panasonic plasma has an SD slot but it didn't work since it handles AVCHD files, not QuickTime. You'll find a metal tripod mount on the bottom and a compartment that holds the battery and your choice of an SD, SDHC, or SDXC card. The new SDXC format currently has 64GB capacity with the potential for 2TB in the years ahead. The camera measures 3.9 x 2.2 x 1.1 inches and weighs 5.6 ounces (159g) with battery and card. The Panasonic FH20 is simple, light, and you'll have no issues carrying it around with you all day. Lens. Even with its tiny size, the Panasonic FH20 sports an 8x DC Vario optical zoom lens. It has a range of 28-224mm so you can take interesting wide-angle landscapes and family shots as well as zooming in on faraway objects, as I did of fishermen on jetties as well as architectural details on older buildings on the Jersey Shore. The lens has a range of f/3.3-5.9 with 9 elements in 7 groups with 3 aspheric lenses and 6 aspheric surfaces. Macro gets as close as 1.97 inches (50mm). The Lumix FH20 has Panasonic's Mega OIS optical image stabilization. The system helps eliminate blur from your shots but it isn't perfect--none are. However, combined with proper handling techniques or better yet, a monopod, you'll end up with sharper images. There are three options: Auto, where OIS works all the time; Mode 1 for recording only; and Mode 2 when OIS kicks in when the shutter is pressed. Controls. The main controls of the Panasonic FH20 are as basic and straightforward as any casual shutterbug would want. Nothing is too obtuse, and a brief skim through the supplied Basic Operating Instructions booklet will have you quickly snapping away. The toggle switch surrounding the shutter button is responsive and moves rapidly through the 8x range. I found the few controls to be where they should be. Modes. Limited photographic tweaks are the order of the day for the Panasonic FH20--no manual focus and no individual adjustments of f/stops and shutter speed are available. That's no surprise for a sub-$200 aim-and-forget digicam; the buyer of this camera doesn't want hassle and the Panasonic FH20 delivers convenience. iAuto is readily available by just tapping the iA key on the top of the camera. As noted, iA scientifically guesses the scene in front of it, choosing among six options. This feature works well. Tap the iA button again and you're in Normal mode, similar to Program on other cameras. Quick Menu. Tap the Q. Menu button and you can adjust the level of Mega OIS, burst mode, metering, white balance, ISO, resolution, and LCD brightness. Hit the Menu/Set key and you have access to these items along with the color mode, AF Assist lamp, red-eye removal, digital zoom, and a few others. In burst mode, the Panasonic FH20 captures 1.5 fps at full resolution, but a quicker option is available at lower resolution (4.6 fps at 3MP up to 100 images). Autofocus options include Face Detection, 1- and 9-area; and there are five White balance options plus Auto. ISO settings range from 80-1,600 while the LCD can be set to Auto Power LCD, Power LCD, and High Angle that lets you see the screen properly when holding the camera over your head. With the Color Mode you can pick between Standard, Natural, Vivid, Black-and-White, Sepia, Cool, and Warm. If you opt for Scene Mode, you'll have a choice of 25 different settings ranging from the typical Portrait, Sports, High Sensitivity (ISO 1600-6400), to the unusual, such as Film Grain and Photo Frame. You can choose one of them to be your default under the My Scene mode. Menus. Utilitarian best describes the Panasonic FH20's menu system. It's very linear and basic, giving brief descriptions of the options you select such as "Auto Power LCD" but no definitions or pointers are given. This is not to say you need a degree in quantum mechanics to walk through it--just that it's very basic without any of the pizazz of touchscreens or swiping abilities. You simply hit the Mode, Menu, or Q. Menu keys and use the 4-way controller to move up/down and to the right to make your selections. I guess because all new cameras must have HD video capability, the Panasonic FH20 offers 1,280 x 720p clips at 30 frames per second. You've read my complaints about the lack of a simple way for consumers to enjoy high-def movies on their HDTVs. This movie mode is for watching clips on your computer or sharing them with friends on YouTube and Facebook. Unlike many cameras that now have a direct button or specific setting on the mode dial for recording video, here you have to press the Mode key, scroll down to Motion Picture, make sure the settings are correct then press the shutter. It's a bit cumbersome but not the end of the world. Zooming does not work during video shooting so you have to preset your zoom before you start. The camera uses the QuickTime Motion JPEG format. AVCHD at 24 Mbps it's not, so don't expect miracles. Storage and Battery. The Panasonic Lumix DMC-FH20 uses SD, SDHC, and the latest SDXC cards. The company recommends Class 6 cards; 4GB or 8GB should do the trick for most outings, but since cards are so affordable a spare would be a good idea. The Panasonic FH20 is supplied with a CGA-S/106B 3.6V 740 mAh 2.7Wh lithium-ion battery. Per CIPA standards it lasts for 300 shots, which is pretty good. I found it worked as advertised, but Panasonic offers the 380-shot 3.6V 940mAh 3.4Wh DMW-BCF10PP as an option, not a bad investment if you're planning long field trips. Daylight. I enjoyed shooting with the Panasonic FH20 out in daylight. The first warm days of summer hit the northeast giving me a good excuse to drive down to Asbury Park on the Jersey Shore. I did most of my shooting at the 4,320 x 3,240 pixel setting, kicking off in Auto then moving through the mode options. Videos were shot at max resolution as well. Once home I downloaded everything to a PC, made full-bleed 8x10 prints with no post-processing, and watched the videos on my monitor since this is apparently what Panasonic wants you to do. As a point-and-shoot digicam, I found the Panasonic FH20 very easy to operate. You can quickly move through the entire 8x focal length. The toggle switch is fairly accurate, although you can overshoot your subject; but with a little practice you'll get it under control. It did take the camera a bit longer lock in focus compared to other cameras. Our lab figures timed it at 0.66s wide-angle, 0.88s tele. It did have a very fast prefocused shutter lag of 0.011 second, and a good 1.7 seconds startup time which includes taking a shot (lab results). Detail. The Panasonic FH20 captures good detail, again in brighter light. Our lab results had the Panasonic FH20 capturing a shot every 2.39 seconds in single-shot mode, which is about average for the class, and Panasonic claims a burst speed of up to 1.5 frames-per-second. This is a sub-$175 point-and-shoot, so expecting DSLR-like 0.5 second cycle times and 3+ frames-per-second bursts is unrealistic. Forget capturing speeding children, at least at full resolution. The Panasonic FH20, like most affordable digicams, does best with stationary subjects. (As mentioned previously, though, the FH20 has a fast 4.6 fps burst mode at 3-megapixels, but we didn't test that.) And don't forget, make sure you have the Sun or a reasonable facsimile nearby. My shots on this sunny day were really quite good with very accurate colors. Again these were static subjects such as buildings, colorful boardwalk displays, waves hitting jetties. I was very happy with my prints but there were issues, including softness at extreme telephoto. On the downside, the Panasonic FH20's auto flash raised ISO to 640 at wide-angle in our flash range test, resulting in a mushy image. At full telephoto, ISO went up to a whopping 1,250 and the resulting image is dim and quite blotchy. Corners are pretty soft, especially the upper left corner. Other test results showed Auto white balance renders incandescent light slightly reddish, Incandescent mode comes out too warm, while Manual white balance is on target if a bit cool. The auto flash underexposes slightly from ~1.6 meters, but on the positive side, it has a 4-second flash recycle time which is a good result. The Panasonic FH20 has about average macro performance with images sharp in the center, but they soften rather quickly radiating out. Video clips shot with the Panasonic FH20 were decent given enough light (sound familiar?). Scenes of waves crashing on the shore looked fine on a 17-inch monitor using WMP. Colors were a bit muted, however, and jaggies appeared on brick wall where there should've been straight lines. As far as I am concerned, Movie mode is to be used sparingly; but it can be used--which is more than I can say for some digicams. Considering the price, the Panasonic FH20 is a pretty competent camera with a reasonably long zoom lens of relatively good quality. The 14-megapixel sensor is among the better performers at this resolution, and it will make decent quality 13x19-inch prints from ISO 80 images. See our in-depth image analysis below. Sharpness: The Panasonic Lumix DMC-FH20's wide-angle lens produced strong blurring in the corners of the frame, compared to center, and blurring extends enough into the image area to be obtrusive. At full telephoto, the entire image appears soft, even at dead center, though the corners show slightly stronger blurring. Geometric Distortion: There is strong barrel distortion at wide-angle (0.9%), and a moderate level of pincushion distortion (0.2%) at telephoto. While distortion is only moderate at telephoto, the level at wide-angle is higher than average. Chromatic Aberration: Chromatic aberration at wide-angle is moderate in terms of pixel count, but slightly bright. The effect is much more noticeable at full telephoto, partly due to some strong blurring in the corners of the frame, which exaggerates the distortion. Macro: The Panasonic Lumix DMC-FH20's Macro mode captures sharp details at the center, though blurring and chromatic aberration are strong in the corners. Minimum coverage area is 2.09 x 1.57 inches (53 x 40mm), and color balance is a little warm with the studio lighting. The camera's flash is partially blocked by the lens, which results in a strong shadow in the lower left. Thus, external lighting will be your best bet with close macro shots like this. Color: Color is a little off for bright reds and blues, which are oversaturated in an effort to appeal to consumers who like brighter than life color. Orange tones are also pushed a bit. Hue is also off for cyan, which is pushed toward blue, and some greens, which are pushed toward yellow. Reds are also shifted toward orange. Dark skintones are quite off, with a strong yellow tint, while lighter skin tones are closer to accurate. ISO: Noise and Detail: Detail is fair at ISO 80 and 100, with noticeable softening beginning at ISO 200. Noise suppression becomes the main hindrance here, decreasing overall detail definition, though noise grain itself is a big detractor at ISOs 800 and 1,600. See Printed results below for more on how this will affect your prints. Flash: Our manufacturer-specified testing (shown at right) doesn't work well at wide-angle when the reported distance goes beyond 16 feet, because that takes the camera out of the main lab, so the wide-angle result is inconclusive. (The DMC-FH20's maximum rated wide-angle flash distance is 19 feet.) However, the camera selected ISO 640 for this shot. The telephoto test came out somewhat dim but still usable at 10.5 feet, though ISO was raised to 1,250! Given these results, it'll be best to stick as close as possible to your subjects for bright flash exposures. Auto flash produced a slightly dim image of our indoor portrait scene, retaining some of the ambient light by using a slower shutter speed of 1/40 second, and raising ISO to 320. The Panasonic FH20's image stabilization should handle the slower shutter speed, but subject movement could be problematic at this shutter speed. Incandescent: The Manual white balance handles our tungsten lighting test better than Incandescent or Auto modes, both of which produce fairly strong color casts. Printed: Image quality looks pretty good at 16x20 inches from ISO 80 files. I can see less detail than I have from recent 12-megapixel sensors, but this output is better than other 14-megapixel sensors overall. Detail tightens up when printed at 13x19 inches. ISO 100 shots look better at 13x19 inches, with good color and detail. ISO 200 images are too soft for 13x19, but look good at 11x14. ISO 400 shots are good for wall display at 11x14 inches. ISO 800 shots reproduce well at 8x10 inches, with some softness in low-contrast areas, which gets better when printed at 5x7. ISO 1,600 files are decent at 5x7, but look quite good printed at 4x6 inches. Overall, a good performance from an inexpensive camera. There's no question that last year's 12-megapixel sensors were sharper, but among 14-megapixel sensors, the Panasonic FH20 outperforms recently reviewed cameras. Shutter lag: Full autofocus shutter lag is on the slow side of average, at 0.66 second at wide-angle and 0.88 second at full telephoto. Prefocus shutter lag is 0.011 second, quite blazingly fast. Cycle time: Cycle time is about average for its class, capturing a frame every 2.39 seconds in single-shot mode. Panasonic rates the FH20's full resolution continuous burst mode at 1.5 frames-per-second, but we didn't test that. The FH20 also has a high-speed burst mode, rated up to 4.6 frames-per-second at 3-megapixels. Flash Recycle: The Panasonic Lumix DMC-FH20's flash recycles in a relatively quick 4 seconds after a full-power discharge. Large capacity, high-speed SD/SDHC/SDXC memory card. 4 to 8GB is a good tradeoff between cost and capacity. For a basic tote-anywhere camera, the Panasonic Lumix DMC-FH20 is a good option especially since it's readily available for less than $175 at legitimate online retailers. It's extremely compact but has an 8x optical zoom that starts out at a nice 28mm wide-angle and reaches 224mm at telephoto. The Panasonic FH20 is a bit slow, so don't expect to capture fast-action sporting events; it has limited photographic tweaks and Panasonic didn't include HD video output in this model, but it's clear they were trying to offer a low price point. Like many 14-megapixel point-and-shoots, noise at higher ISOs is a real issue. 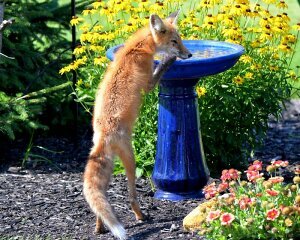 If you plan to do a lot of shooting outdoors, images from the Panasonic FH20 will not disappoint. In difficult lighting situations, there are definitely issues. Those minuses front and center, you might find this tiny handful a good solution for your point-and-shoot imaging needs. Just don't forget to bring the sunshine.